My new name is Baddy. Guys, I think I’m slowly but surely losing my Amish-ness. When I was a freshman in college, I felt like I was in this protected bubble. My friends and I in high school really enjoyed playing Monopoly and eating mass amounts of pizza for fun. I didn’t understand how my classmates got their hands on alcohol or why they even wanted to drink for that matter! I was having the time of my life fake urban exploring with my friends and watching movies.But slooooowly and surely I’m changing my tune. Is that a good thing? Going to college, I got the questions a lot, “do you drink? do you smoke? What do you even do for fun?” ALLLLLLLLLL THE TIIIIIME. I had made a conscious choice not to drink (I thought ever) but I slowly changed my mind once I turned 21 and felt more comfortable. I was always the DD for any party and I always could tell when things were just out of control as well as out of my comfort zone. The second someone spills jungle juice on me is typically when I called it quits for the night. When I was almost 21, I started to get really curious about what being drunk was like and why it seemed like everyone was having and experiencing some type of fun I didn’t understand. I spent my first night being drunk at my friends house, just the two of us so I was really comfortable. I wasn’t traveling nor was I surrounded by a bunch of people I didn’t know or trust. We ended up buying pink lemonade vodka since I don’t like anything fizzy and of course, was the cheapest and girliest thing we could buy. As I became more intoxicated, I quickly found out that I was basically just a giggly, happy-go-lucky drunk. Probably the best kind of drunk you can be. And I had fun. No shame in my game! The rest of my drinking life then became history. So maybe I wasn’t so hung up on the idea that I was never going to drink despite what I told my parents my entire life growing up. But I found a way that I felt comfortable and in control of the situation. The whole next year revolved around drinking with my friends on the weekends then. It was always about what party we were going to or what bar we were trying out. This isn’t a saga about how I’m an alcoholic now or anything because I’m probably the biggest lightweight you’ll ever meet with no social life. YAY! All I’m saying is that I think it’s great for everyone to come into their own whatever way that means. 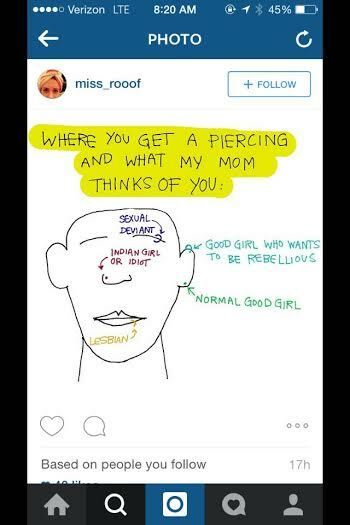 You love body modification whether that means piercings or tattoos or both? Awesome. Are you more comfortable breaking the gender norms and wearing clothes that express who you really are? I’m in full support. I don’t believe in tolerating inequality no matter what form it takes and I think it’s amazing that society is finally starting to accept all different walks of life! Be nice to each other, okay? That’s really all I’m saying. 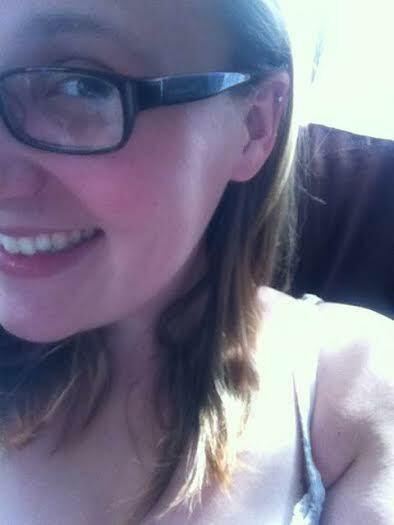 Enough with my Golden Rule babble, you want to see a picture of my new badass piercing right? RIIIIIGHT! Whats your story? What kinds of rebellious things have you guys done? Check back on Thursday for my recipe of homemade oreos! THEYRE SO GOOOOOOOOOOD. Until next time!